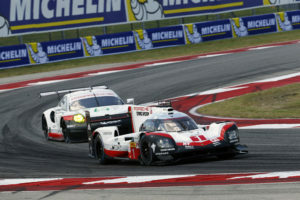 class="post-template-default single single-post postid-1152 single-format-standard wpb-js-composer js-comp-ver-3.6.12 vc_responsive"
The two Porsche 919 Hybrids monopolize the front row for the six-hour race on Saturday in Austin, Texas (USA). The reigning world champion Neel Jani (CH), André Lotterer (DE) and Nick Tandy (GB) will start from pole position. The championship leading Le Mans winners, Earl Bamber (NZ), Timo Bernhard (DE) and Brendon Hartley (NZ) qualified second for the sixth round of the FIA World Endurance Championship (WEC). The session was held in hot conditions with a 33 degree Celsius ambient temperature and 44 degree Celsius track temperature. In the WEC, the average of the two fastest laps of two drivers counts for the qualifying result. Jani did the overall fastest lap on the 5.513 kilometre long Circuit of The Americas in 1:44.656 minutes. Afterwards, Tandy held his nerve when he had to go on a second lap in the 20 minutes long session. His first lap time was deleted because of exceeding track limits. Tandy managed another top lap time. With an average time of 1:44.741 minutes, car number 1 stayed on P1. Bamber/Bernhard achieved an average time of 1:44.994 minutes for car number 2. All four Porsche drivers topped last year’s best mark of 1:45.703 minutes set by Lotterer in an Audi. It is the 18th pole position for the Porsche 919 Hybrid since its debut in 2014 and the third this year. Less than two weeks ago, Porsche managed a front row lock-out in Mexico City. However, the qualifying success of 2015 will remain historically unique: Back then no car other than a Porsche 919 Hybrid made it on to the front row all year at a time when three manufacturers contested the ultra-competitive LMP1 category. In the third free practice on Friday morning, the two Porsches came second and third. Before the six-hour race that starts at noon on Saturday, Porsche has scored 199 points in the manufacturers’ world championship with Toyota on 141.5 points. In the drivers’ rankings, Bamber/Bernhard/Hartley lead with 134 points. After wins in Le Mans, at the Nürburgring and in Mexico, they are 41 points ahead of the best placed Toyota trio. Jani/Lotterer/Tandy lie third in the championship (65 points).